What are the best camping percolators in 2019? If you lack time to research about the best camping percolator, but you still wish to make a good purchase, this short paragraph will show you some of the options we recommend. After taking an in-depth look at some of the most popular products available online, we have concluded that the unit you should get is the Coletti “Bozeman”. The solid steel construction makes it perfect for percolating coffee the old-fashion way so that you get a genuine camping experience. The unit does not feature any plastic or aluminum, which allows you to use a campfire to prepare your coffee. Similarly, unlike the drip methods, this model extracts a fuller and richer flavor for a more powerful taste that will give you energy for the entire day. In the unlikely event that you are unable to find out first choice available for sale, you should consider the Coleman Stainless Steel Percolator. We know that a good camping percolator can be quite tricky to find, which is why we have compiled the following short buyer’s guide. Below you will find what the basic requirements that your new camping percolator should meet are, as well as more information about this type of product. 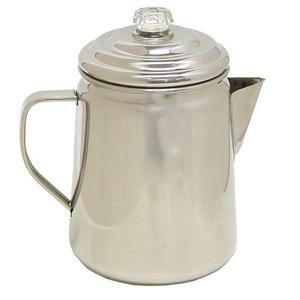 The first aspect that you should consider before purchasing a camping percolator is the capacity that you need. When camping, you should be very careful what you bring with you since any extra pound can be quite taxing on the body. Percolators are available in a wide range of sizes anywhere from a 2 to 4-cup capacity, all the way to an impressive 12 cups. If you are camping alone, then a smaller one might be the best option. On the other hand, if you tend to camp with your friends or family, going for a larger product will work best. You should be careful when buying your first product since not all options are designed to withstand the hardships you can encounter when camping. The good thing is that since most manufacturers will mention if their product can be used for camping, finding the right one for your needs will not be as difficult anymore. Most camping options are built to be used on a gas or wood stove, or even on a grill. You can also find electric options, but these should only be considered if you own a portable generator or battery capable of powering the device. As far as materials are concerned, you should get models that are built from quality stainless steel as these are capable of handling the intense heat of a campfire. You should not get models that feature plastic components as they can melt and catch fire easily. As a plus, stainless steel is a material that resists corrosion and that wipes down easily for effortless cleaning. If you are wondering why campers prefer a percolator instead of other coffee makers, the answer has to do with how easy this option is to use on a campfire. There’s also the fact that the coffee it produces is very strong, precisely what active people need to replenish their energy in the morning. Another great thing about this option is that it can bring coffee quickly to where the people are sited. It can also keep the brew hot for longer, and you can’t do that with a regular pot of coffee. 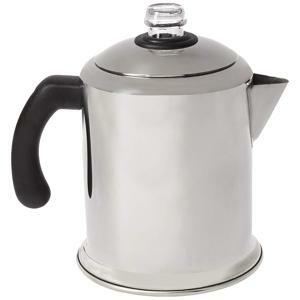 If you are looking to get a cheap camping percolator, our list of top-rated products will surely satisfy your needs. The models we have showcased below stood out thanks to the overwhelmingly positive camping percolator reviews they have received, as well as the quality, reliability, and durability that they boast. This option can prepare 9 cups of delicious brew and is made from 18/8 stainless steel with a glass cover knob to help you see when the coffee is ready to be served. You also get a comfortable handle that will remain cool even when the coffee inside the percolator is boiling. Sipping a cup of delicious coffee on a chilly morning while the sun rises is one of the greatest pleasures of life, and this model is built with the needs of campers in mind. Its rugged design can handle even the harshest environments. The unit is also designed not to weigh you down, and the 9-cup capacity makes it perfect for people who like to camp with friends. 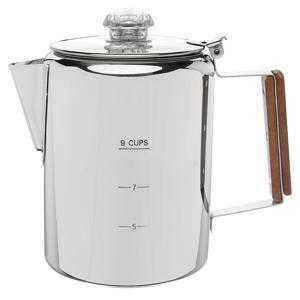 Even if this is your first time using a percolator, Coletti has your back seeing as the unit comes with in-depth instructions that will show you how to make the most out of your new purchase. The Coleman camping percolator can brew up to 12 cups of coffee in record time, and you can use it on either a camping stove or a grill. The rugged stainless steel construction will ensure that the unit can handle even the most inhospitable outdoor conditions. Cleaning the unit is effortless seeing as all it takes is to wipe it down with a damp cloth. What’s even more impressive about this model is that despite its large capacity of 12 cups, it manages to remain very lightweight meaning that it won’t weigh you down. Its compact shape will make it very easy for you to pack it together with your other camping gear. The large capacity makes it very easy to brew plenty of coffee to satisfy large groups, while the convenient side handle allows for smooth and comfortable pouring. The lid locks itself securely during pouring so that you don’t risk spilling coffee or burning someone’s hand while pouring the brew. This sleek percolator can brew 4 to 8 cups of coffee, and it comes with a permanent filter basket which makes it ideal to use when camping since you won’t have to carry extra paper filters with you. Paper filters can also be very messy, and with the permanent filter basket, cleaning the unit will be effortless. As is expected from a quality model, the construction features durable stainless steel that is polished to a mirror finish. The stay-cool synthetic handle will help protect your hands and make pouring hot, delicious coffee that much more enjoyable. The clear knob will let you know when percolating begins and will stay in place when pouring to prevent any unwanted accidents. The non-reactive interior will prevent the water from absorbing any undesirable tastes or odors so that you can enjoy the perfect cup of joe. As a plus, apart from brewing one mean cup of coffee, the classic stainless steel design will provide long-lasting beauty.